Did you know Sister Briege appeared on the Oprah Winfrey Show some years ago? This powerful, humorous and inspiring story relates events surrounding this. Did you know that the Lord sometimes gives Sister Briege items from His To-Do List? You’ll hear about that on this talk as well. Please share word of this podcast episode with your friends. 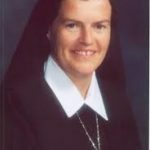 Sister Briege is found at www.sisterbriege.com and she and the St. Clare Sisters have a prayer request line you can call to leave intentions. That number is 727-781-5906. Our music features talented musician, composer and head of ILP Music, Vince Ambrosetti… we particularly like one of the pieces he composed and which we played on this show, SANCTUARY… Go to www.ilpmusic.com to find Vince’s and many other great artist’s music. This entry was posted in Podcasts and tagged Oprah Winfrey Show, Sister Briege McKenna, Spiritual Motherhood, Vitamin M. Bookmark the permalink.